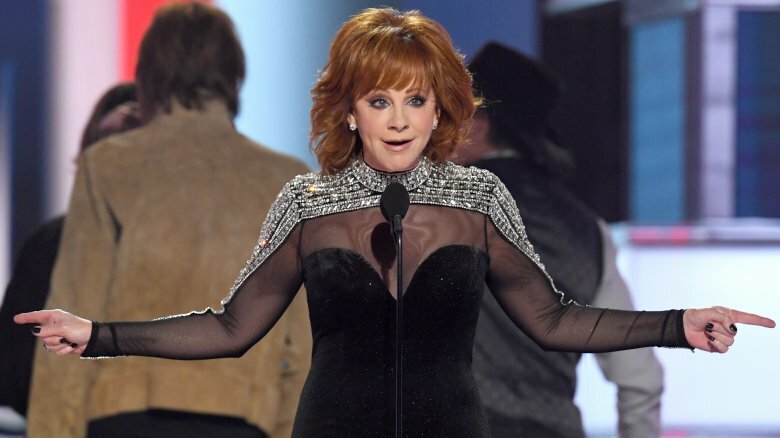 With Reba McEntire hosting and Keith Urban taking home the top prize, the 54th annual Academy of Country Music Awards was business as usual. The performances were powerful (just look at newcomer Ashley McBryde's stunning solo performance) and the jokes were, well, like an awards show (i.e. cheesy, politically correct, and yawn-worthy). Blake Shelton and Gwen Stefani Blake Shelton-ed and Gwen Stefani-ed all over each other, Miranda Lambert pretended it was normal for a country megastar to marry a policeman a couple months after meeting him (though we can't really knock true love), and Kacey Musgraves was the rare gleaming prism of rainbow light. Musgraves ended up beating out all of the men in her category for album of the year, but the show was overwhelmingly lacking in female representation, which McEntire, hosting for the 16th time, even mentioned it (though we did get Carrie Underwood back from her maternity leave, so that helped). That doesn't mean women didn't shine behind-the-scenes, as Underwood went in for a pre-show breast pumping session and Ashley McBryde triumphed through the pain of an unsupportive dad. 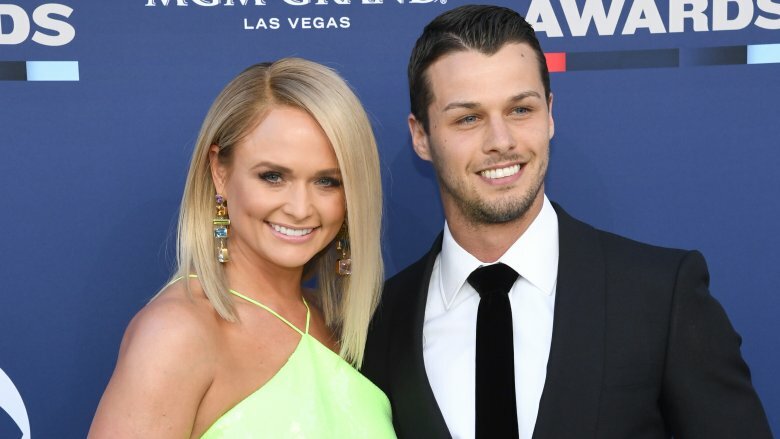 Here's what you didn't see on TV at the 2019 ACM Awards. Forget Johnny and June. Blake Shelton and Miranda Lambert were the modern day king and queen of country-pop, but the pair shocked fans when they announced their split in 2015. Since then, they've been skirting awkward run-ins at country music's biggest awards shows. In an interview with Seth Meyers (via E! News), Shelton admitted the 2015 CMAs were going to be "awkward" because of his divorce, but it seems like time really does heal some wounds. Hollywood Life reports that by the time the 2019 ACM Awards rolled around, Shelton was no longer worried about running into the "Little Red Wagon" singer because he believed there was a slim chance they'd actually cross paths. Unfortunately, all the physical space in the world couldn't have made Lambert's fiery performance any less biting. Lambert, who was nominated for female artist of the year, reportedly shaded Shelton big time when she performed a medley of her biggest breakup hits. During her rendition of "Little Red Wagon," she swapped out the lyrics "I live in Oklahoma" for "I got the hell out of Oklahoma" — ouch. According to Taste of Country, the star adopted the lyric change at all of her live shows, but it's particularly bold with Shelton, who shared a home in Oklahoma with the singer, sitting in the audience. Gwen Stefani must've been shrinking in her chair. 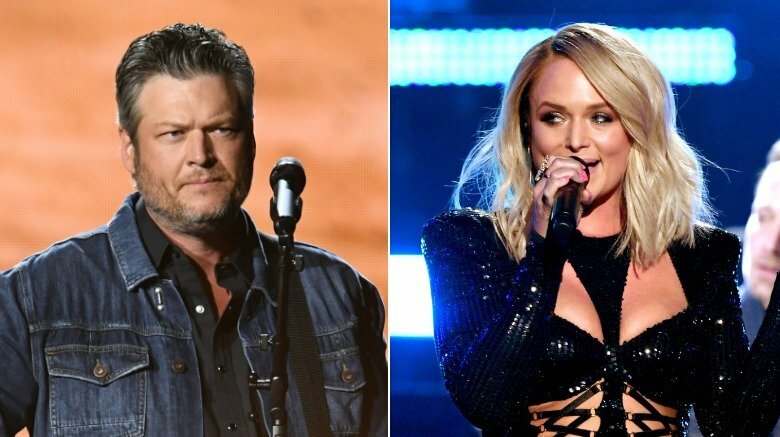 Despite the fact that Lambert threw a little shade at Shelton during the awards show (got to love that country star drama), she probably wasn't actually sweating having a run-in with her ex. 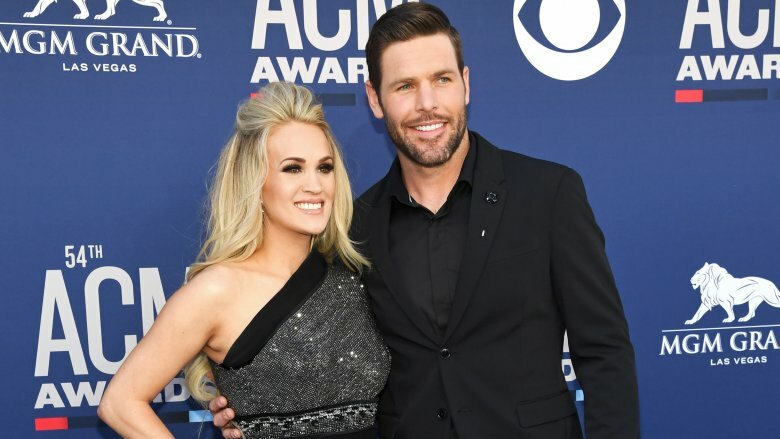 The star used the 2019 ACM Awards to make her red carpet debut with her brand new husband. Lambert, who Taste of Country calls the "most-awarded artist in ACM history," secretly married NYPD officer Brendan McLoughlin in early 2019. According to E! News, the Instagram wedding announcement was the first time the country superstar ever mentioned McLoughlin, and just a few months prior, she claimed to be "happily single." Who doesn't love a good whirlwind romance — especially when there's scandal involved? According to People, McLoughlin was engaged to Staten Island native Jackie Bruno "just months" before tying the knot with Lambert. Their relationship allegedly ended when the NYPD officer's baby mama, who was seven months pregnant, messaged Bruno to let her know she was expecting. McLoughlin reportedly met Lambert three days before his son was born. Despite the dramatic beginnings, Lambert and McLoughlin were all smiles on the red carpet. The star donned a lime green gown while her hubby looked sharp in a sensible suit. 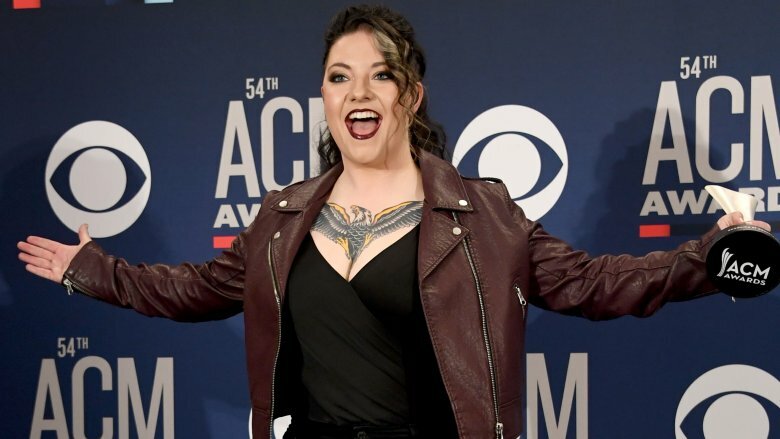 Ashley McBryde had her viral moment ahead of the ACM Awards. The country star discovered she was crowned new female artist of the year before she even showed up to Las Vegas. It was all thanks to a call from Carrie Underwood, which McBryde documented on Instagram. In the video, the star giggled, admitted her hands were shaking, and threw her drink in celebration. She later caught up with People to fill fans in on what was going through her head when she realized Underwood was on the other end of the line. "'Holy s***' — the most common phrase that goes through my brain," she told People. "We're standing in the barn lot out at my little place, and we were burning brush. And then the phone rang, and it was Carrie Underwood. I was like, 'This is like the weirdest feeling. This is the weirdest feeling.'" McBryde's major moment wasn't without one small hiccup. The star also admitted that when she threw her drink in excitement, she had to take somebody else's drink because hers was sprinkled all over the lawn. It kind of puts a damper on a celebratory toast. 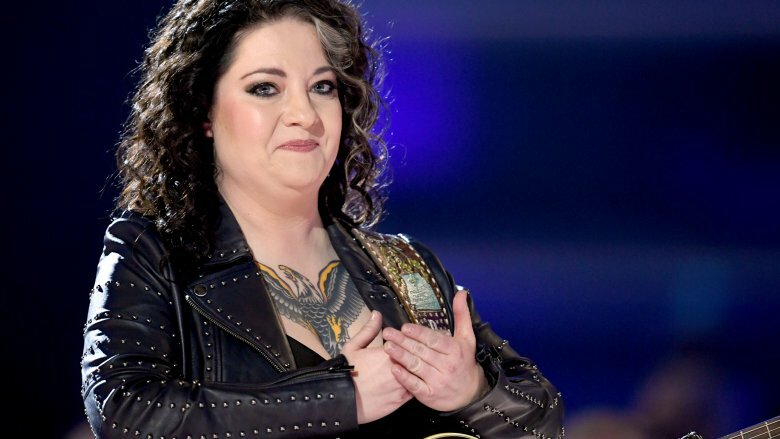 The 2019 ACM Awards were a big night for Ashley McBryde. Not only did she win the title of ACM new female artist of the year, but the star got a chance to perform her hit "Girl Goin' Nowhere" (and she did it completely solo!). Despite her enormous success, there was one person who probably wasn't watching: McBryde's dad. In an interview with CBS This Morning, McBryde revealed that her dad doesn't support her music career. Backstage at the ACM Awards, the star told Brian & Chrissy in the Morning (via Taste of Country) that her favorite song she's written is "A Bible and a .44," which is actually about her dad's tough stance on an entertainment career. Basically, he doesn't approve of it at all. "When I told him I was nominated for two ACM Awards, he said, 'I guess I don't know what that is.' And he wasn't trying to be mean, he was just saying, 'I don't care about that kind of thing,'" she said, adding, "It's actually a really raw nerve that I try to step away from as often as possible." 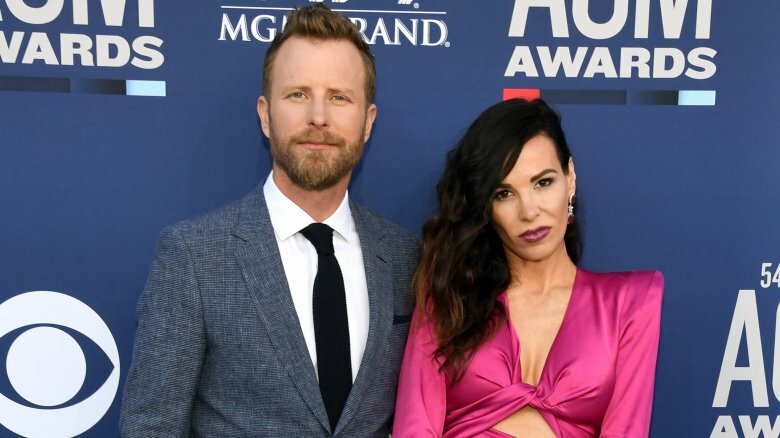 Dierks Bentley was pretty glad he didn't host the ACM Awards. Though Bentley hosted the event twice in the past, the honor was given to Reba McEntire in 2019. This marks the country legend's 16th time hosting since her 1986 debut, and she's taken home just as many of the coveted awards throughout her career. In a Taste of Country interview, Bentley admitted that it was fun hosting alongside Luke Bryan, but "not hosting is pretty great." Who needs the pressure of having to entertain a crowd? "It's also fun just to get a chance to appreciate being there. I wasn't nominated for the Grammys this year, so I just watched it from home, and it was like, wow! I could really appreciate every performance and the collaborations and all the great female performances," he said. "It was like, I missed not being there because that means I'm not nominated, which is probably bad for business, but it was nice to be able to step back and enjoy it, and for me, the ACMs, just being there in the audience and no pressure, it's definitely more fun." Bentley, who was nominated for four separate awards, wasn't totally out of the woods on the big day. The star still performed alongside Brandi Carlile during the broadcast. 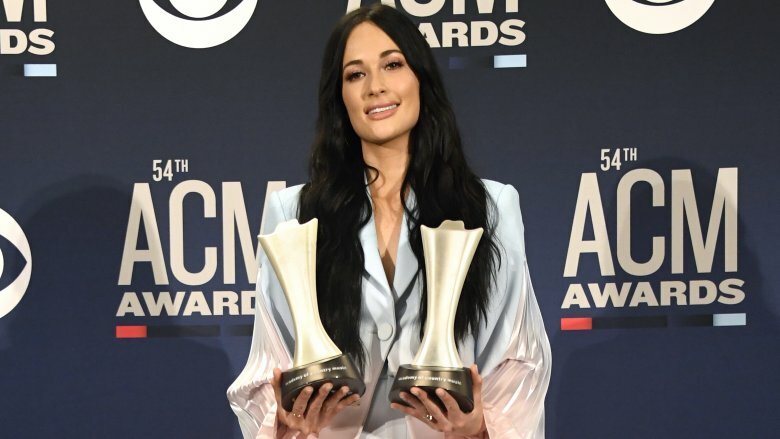 Kacey Musgraves has had a big year. The starlet was nominated for a whopping five ACM Awards and managed to beat out the boys and the girls for the coveted title of album of the year and female artist of the year. Of course, she used her outfit to give a little nod to her Grammy-winning LP, which makes sense considering Golden Hour is the reason she scored so many ACM nominations to begin with. In a red carpet interview with People, Musgraves admitted she partly picked her ombre pantsuit because it reminded her of her album's cover art. The artwork features a dreamy portrait of the star holding a folding fan over her face. "I saw it and immediately was like, 'This has my name written all over it,'" she told People. "It even kind of reminds me of the album cover a little bit. A nod to the fan on the album cover, just all the pleats. I love a gradient, I love anything ombré, and anything rainbow, clearly." Carrie Underwood, resident queen of the breakup song, happens to be a very good multitasker, something all new mamas eventually learn how to master. In an Instagram selfie, the female artist of the year nominee showed off a snap of her getting ready for her performance. Little did most of us know that the false eyelashes weren't the only accessory the American Idol alumni had hidden in her bag. She came clean about using her breast pump while glamming up for the broadcast. "Getting ready for my performance … also pumping," she wrote. Though Underwood didn't win her nomination this time, the singer undeniably has a prize waiting for her at home. The star welcomed her second child in January 2019, but you'd never know by the look of the gown she wore to her first red carpet appearance since giving birth. In an Instagram post, Underwood admitted she's been hitting the gym to get back her post-baby bod but was struggling a little bit in the cardio and weightlifting department (who can't relate?). Carly Pearce was celebrating more than just her new female artist of the year nomination at the ACM Awards. 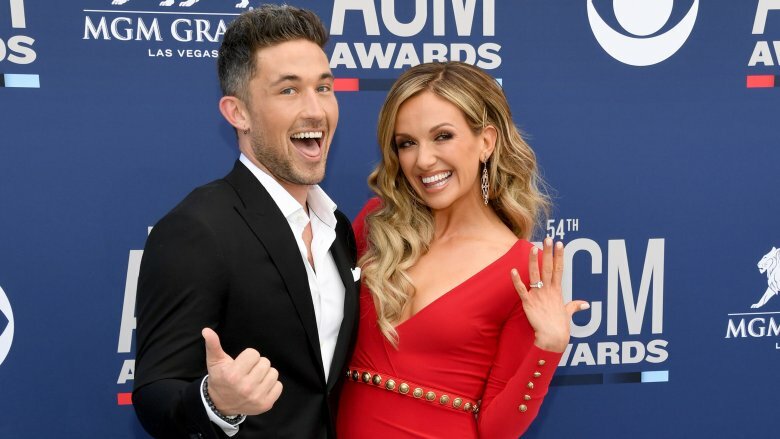 In December 2018, the star got engaged to Michael Ray, who was also nominated for new male artist of the year. Talk about a power couple! The pair is currently in the wedding planning stages (they've already picked a rustic outdoor location), and Pearce used her red carpet moment to show off her rock and divulge some details about her dress. In an interview with Entertainment Tonight, the songstress admitted she opted for an off-the-rack dress rather than something custom. "I have it, and it's awesome," she said. "All of my girlfriends think it was custom made for me, and it wasn't, so it makes me feel like it's a good one for me." The stars also got a bit of nuptial advice from country legend Keith Urban and actress Nicole Kidman, who have been together since 2005. In a red carpet ACM interview with People, Kidman suggested the secret to marriage was "happy wife, happy life," while Urban said, "Definitely show up, and don't ever stop doing that." It's not often an awards show host slams the actual awards show they're hosting. Nonetheless, Reba McEntire refused to hold back, and after hosting 16 ACM Awards, what does she have to lose? Both ahead of, and during the ceremony, the country icon spoke out about the lack of female representation. 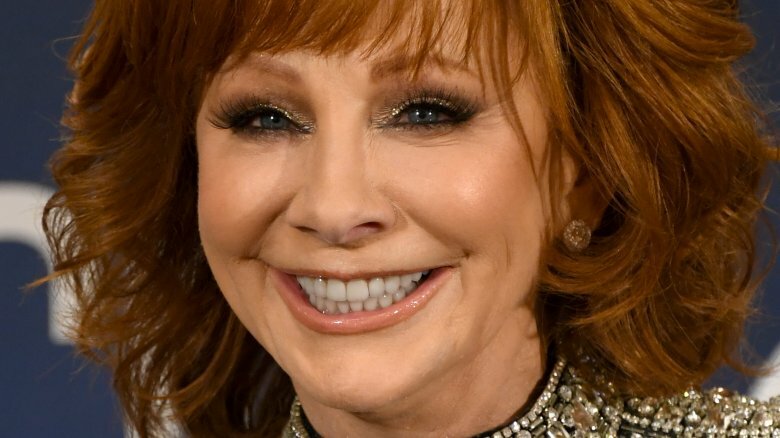 Though McEntire has won the coveted award for entertainer of the year in the past, that same category had no female nominees in 2019. We can't help but suggest Kacey Musgraves should be livid. "There's great female vocalists who have been working their tails off, and women work really hard not only with the hours they put in to hair and make and up and wardrobe [sic], but they work hard on-stage too, so I think they deserve that recognition," McEntire told Fox News. Though the host vowed to stay away from politics throughout the broadcast, she did make a jab at the lack of inclusivity. The singer-turned-sitcom-star joked that it had recently snowed in Vegas, which froze out all of the women from the entertainer of the year category. "You know what that didn't bother Kacey Musgraves because she's been too busy carrying all her Grammys around," McEntire added. Zing!